The Bible is full of music from Exodus 15 right through to Revelation 15. Of course, the book of Psalms is the richest portfolio of songs in the scriptures, and Psalm 139 is among its greatest. The problem for us when it comes to the music of the Bible is that we are given the lyrics but not the melody, key, or tempo; we have to decide these for ourselves. For example, Psalm 139 can be sung slowly in a minor key as a lament, or it can be sung brightly in a major key as a song of praise. I think that David intended his Psalm to be sung in a major key, but I suspect that many of us hear it in our heads as a lament. I think that the key sentiment of the song is captured in the words, ‘you have laid your hand upon me’. When I read this in the context of a song, and knowing that David was a musician, I see Jesus, the Master Craftsman and Maestro Musician taking me up in His hands to play the music of heaven in, through, and with me. David’s song presents a wonderful truth: God created us and cares for us, and nowhere is this clearer in the Psalm than in verses 13-18 I want to use a recent project of mine as an example of how this truth applies to our lives. 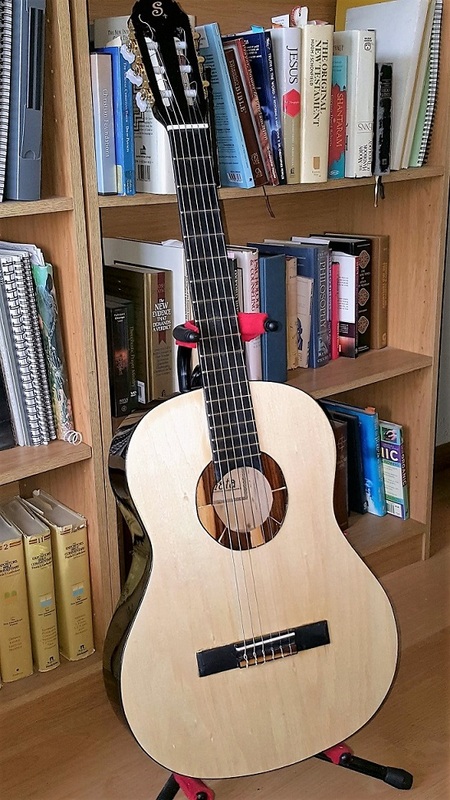 A few months ago I bought the cheapest new Classical Guitar I could find on the internet ($50) and set myself the following challenge: make this poor guitar look better, play better, and sound better, without spending any more money on it. Here is what it looked like when it arrived. At first glance, it looked OK but closer inspection revealed rusted strings, high and tarnished frets, an unplayably high action, and layers of plastic/varnish complete with blemishes and missed spots. I later discovered that it was made of three-ply Basswood, totally unsuitable for a classical guitar. I played a short classical piece on it and someone remarked that it sounded like rubber bands on a cigar box! Most of us look a bit like this guitar. Some are born into this world with imperfections but many more are beaten up by life itself. Circumstances, other people, or our own poor attitudes and decisions leave us tarnished, pitted with blemishes, practically unplayable, and our life-song sounding weak and toneless. But all this changes when we are in the hands of The Master. When we come to Jesus to receive new spiritual life, He breathes eternity into us but then He does not set us down; He works on us constantly to transform us into His image – so that we will look, play and sound better. As I worked on the flawed guitar, I realised I was, myself,demonstrating a small and imperfect example of this transformational process. I stripped and scraped all the gunky paint from its soundboard and sanded it down until the original wood was exposed. Surprisingly, the plywood that was exposed responded to the ever finer sanding and started to look quite pretty. I also knew that the thinner, cleaner soundboard would vibrate more freely and produce a much better tone. I took off the rusty strings, filed down the frets to a uniform height and smoothed the rough fretboard so that the notes could be fingered with accuracy and ease. Then I lowered the plastic saddle and shaped it so that the intonation and action would be improved. The old rosette (the design around the sound hole) had been a cheap transfer that had come off when I refinished the soundboard so my daughter and I fashioned a new one from a piece of Brazilian Rosewood veneer I had. I reconditioned an old set of strings and strung the guitar… then I played … and it sounded even better than I had expected. Here is a picture of the transformed guitar. Now I am neither a Master Craftsman nor a Maestro Musician so just imagine what Jesus The Master can do when He lays His hands on us! He creates a new spiritual life within us and then He works on and with us to transform us into His own image. He lays His hand upon us. He takes us up to make something wonderful out of our flawed and battered lives. There is a well-known poem about an old violin called ‘The touch of the master’s hand’. I found a version set to music and I am sure it will bless you. CLICK HERE TO VIEW IT. I also discovered a copyright free version sung by Walter Brennan and it is below for you to save and enjoy if you so desire. If you have found yourself like a flawed instrument, battered by circumstances, and singing your life-song in a melancholy minor key, then turn to Jesus, the Master, and yield to His hand. He will give you new life. He will take you up and play the music of heaven in, through, and with you. If you would like to hear the whole sermon I preached on this topic, listen to The Touch of the Masters Hand HERE, or click HERE for more images of the “Beater to Better” transformation in PowerPoint. If you are reading this before June 2016, then have a look at my PREVIOUS POST to see how you can own “The Better” guitar for free!